Temple Beth El in Stamford, Connecticut now has one of the largest installations of its kind on a house of worship in the United States. The new, 210 kW Photovoltaic Solar Panel System, utilizes 845 (250 watt) panels on the temple’s 30,000 square white “Energy Smart Solar Ready Roof” with three inches of insulation. The estimated power production is 237,479 kWh per year, and supplies 70-percent of the synagogue’s annual electrical needs. The congregation was already well on its way to being a model in energy efficiency due to a recent lighting upgrade throughout their building and outdoor spaces, that included switching to more efficient LED lighting and installing lighting occupancy sensors and high efficiency variable speed motors and drives. The project is a point of pride for the congregation, whose leaders say it emphasizes the Jewish concept of Tikkun Olam, which means “repair the world” and urges people to fix what’s broken in society. The synagogue received funding for the project from CL&P and Altus Power Management, through grants from the Connecticut Energy Efficiency Fund and the Zero Emission Renewable Energy Credit Program. The efficiency fund supports programs that provide financial incentives to organizations which want to reduce the amount of energy they use, while the zero emission credit program promotes the installation of renewable energy devices. The benefits are that the synagogue can supply its own energy needs at a discounted rate and excess energy can be sold back to the grid and go toward their bill. The congregation leaders said they have a 25-year arrangement with Altus, after which they can purchase the solar panels or remove them. The solar project is dedicated to Norma Mann, a woman who spent decades as a leader and congregant at the synagogue and whose family is partially funding the project. 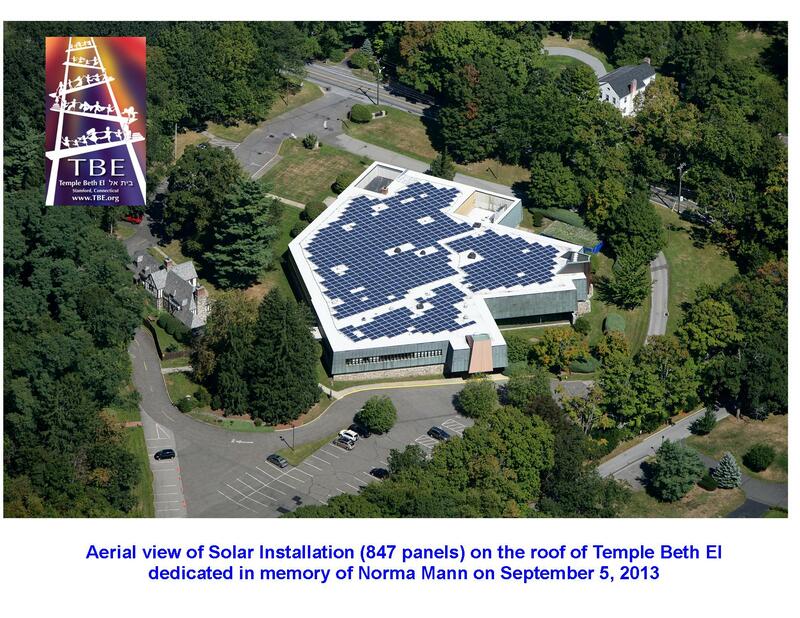 The solar project is being used in Temple Beth El schools. As part of a lesson, the preschoolers watched the installation, wearing plastic hard hats, and made pizza in a solar oven. They’re also growing a garden on the property and organizing a CSA to support the local farmers. The members of TBE felt a moral obligation to help save the planet, beside saving money! Hopefully this will inspire other congregations to pursue a course of sustainability because of its contribution to the environment and the obvious financial benefits. A sign at the entrance to the synagogue urges members to visit a website about the project — liketheroof.com.